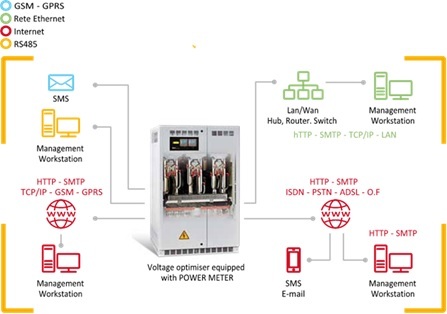 APS automatic voltage optimisers are one of the solutions offered by new technologies to users and supply an operating voltage which minimises consumption without impairing performance or reducing reliability. They allow businesses to obtain significant saving of energy, extend the working life of electric equipment, and secure a significant reduction of carbon dioxide emissions. 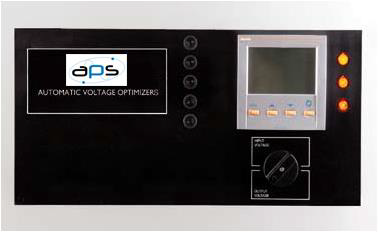 Standard single-phase models can deliver a variable voltage from 230V to 207V with input voltage comprised in the 207-253V range. Standard three-phase models can deliver a variable voltage from 360/270V to 400/230V with input voltage comprised between 360/207V and 440/253V. Models capable of broader input voltage variations may be built on demand. These may be needed because voltage may sometimes exceed the 10% tolerance specified in the supply contract. Load capability from 15KAV to 3000kVA meets a vast range of load requirements.